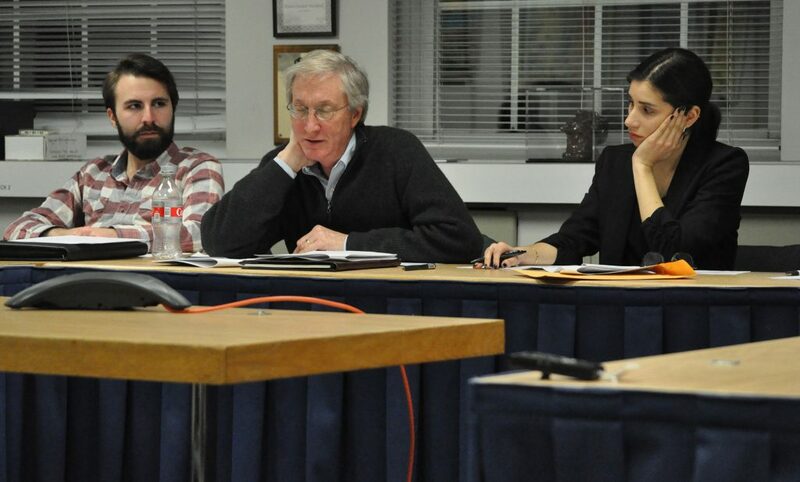 From left, Norwalk Common Council members Chris Yerinides (D-District A), Tom Livingston (D-District E) and Eloisa Melendez (D-District A) query Eric Zwerling, speaking to them by telephone. NORWALK, Conn. – Norwalk Common Council members wrestled with noise issues Wednesday as they worked to craft a new noise ordinance. The proposed daytime sound level decibels for Washington Street “are not draconian as has been inferred or outright stated,” noise consultant Eric Zwerling said, addressing the Committee by telephone. The Committee has hired Zwerling, president of The Noise Consultancy, to help draft the ordinance. The Council has been working for nearly two years to address noise issues. “The hard part of this ordinance, it seems to me, is this Washington Street development district… The rest of it is something we can come to an agreement relatively quickly on,” Council President Tom Livingston (D-District E) said. Council member Colin Hosten (D-At Large) pointed out that the other issue is residential areas located near industrial zones, such as Village Creek, where he lives. About 10 people attended the special meeting, including some Washington Street business owners and South Norwalk residents. Diane Lauricella spoke on behalf of South Norwalk Citizens for Justice. “Some folks say that anyone who rents above these bars and restaurants, they should have known what they signed up for. Well, I dismiss that on the grounds that because we didn’t have a very good noise ordinance before now that I think if there is some incentive set up by this committee to think about noise attenuation, for those that are currently in the first-floor tenancy, we can allow grandfathered noise hazards,” Lauricella said. The proposal to require a maximum 35 decibels inside the home of a Washington Street resident at night is “setting up businesses on Washington Street to fail,” Braman said, arguing that a soft whisper 5 feet away is 40 decibels and HVAC equipment on apartment buildings is 50 decibels. Livingston asked about measuring noise, and Zwerling explained in painstaking detail the need to determine ambient noise so as not to hold business owners responsible for noise they’re not creating. Council member Doug Hempstead (R-District D) asked if it would be possible to create levels of zones for background noise, so the noise levels could be factored in without elaborate measuring. That would be ill-advised, Zwerling said. “The baseline ambient varies tremendously, from day to day, from season to season, circumstance to circumstance,” depending on things like the state of traffic, the number of pedestrians that are about or the state of the road, if it’s dry or wet, he explained. “To try to get measurements that would capture every single scenario, would be lunatically expensive,” he said. Sound levels outside a building might not necessarily correlate to sound levels in an apartment over a bar. “It could be in compliance outside and not necessarily in compliance outside,” he said. Zwerling took readings on a Friday night in April and again in late July, finding that the noise level in an apartment over Our House was 37 to 47 decibels in April and in July it was 41 to 47 decibels. That means that a daytime allowance of 45 decibels inside an apartment is “right there,” as it would “allow almost all of the activity that I measured on a Friday night in April and on a Saturday night in July,” he said. Livingston asked about the sound level of a whisper. Zwerling had mentioned Hoboken, N.J., and Livingston asked what their inside levels are. “The Hoboken ABC has a different approach to this entirely…. If they get enough complaints about a facility, they don’t really tell whether you’re in compliance or not. They start pursuing you,” Zwerling said. If SoNo businesses are concerned, they can do a calibration event, metering the levels in their facility to determine what’s acceptable and installing equipment to monitor the situation as an evening wears on, he said. The changes proposed need to be consistent with the Connecticut Department of Energy and Environmental Protection (DEEP) regulations, Ordinance Committee Chairwoman Eloisa Melendez (D-District A) said, and there’s a limit on the fines that can be issued. It’s possible to penalize multiple offenders by taking away their health permit, and this would get around the state, Hempstead replied. Ambient noise is important because it’s not fair to the businesses to have that included in their measurements, Melendez said. She set a public hearing date of Feb. 19. Having an ordinance doesn’t mean there won’t be complaints, Hosten said. “I like that there’s more defined mechanism for enforcement but it’s not necessarily simplifying things even for the people who were affected, or for the businesses,” he said. Melendez said she’s been in SoNo when the police were called for noise and she observed the officer asking why people call about noise. SoNo residents patronize those establishments, she said. Excessive noise is a health issue, and that’s how the world outside of Norwalk has long viewed it. Norwalk has long been at odds with the official view of HUD, the World Health Organization and other state, national and international agencies. There are a variety of inexpensive ways for businesses to comply with the accepted standards. The more difficult issue is the noise levels in the mixed industrial/residential zones near SONO. The city needs to figure out how to best resolve that problem. But it must be viewed as a health issue, first and foremost. If residents have advance notice of future meetings (even the email alert from City Hall does not give more than a day or so) that would be helpful – more people would show up to listen and add to discussion as this unfolds. Perhaps NancyOnNorwalk might assist here? When is next meeting for this very important issue? NON thanks for covering…the only press in the room! Yes, agree with previous commenters and want them to know that we shined a light on the need for Health Dept. to get involved…previous Health Director was allowed to pass the buck to the Police instead of collaborating in a meaningful way. New Health Director D’Amore is engaged although would like her to offer more vigorous assistance about the health effects of different decibel levels. Lastly, need to expedite the reform of this Ordinance. If needed, please consider “decoupling” the mixed use building section to move along on setting up the management structure…then add it in…the Washington Street issue has caused most of the delay and is much more complicated… 2 years!? Since at least 1975 I would imagine even earlier there have been bars in Sono. Perhaps the people who are complaining should have looked into living in an area that does not have an active nightlife. Just curious did the people who are complaining about excessive noise move into the area after the businesses in question here were established have the establishments gotten louder? I have a feeling this is another case of businesses come to Norwalk with one set of rules then the Council bends to a small group of people. Retail is dead, No one seems to want more residential apartments. What do they prefer vacant space with commercial realtor signs. Disagree with your premise and conclusion. At least this Administration is trying to do something to improve a situation that has been a real problem for decades. I am glad Committee is trying to seek balance, but want them to expedite. Restaurant/bar establishments have turned over multiple times over the years…yet efforts to retrofit sound reduction measures at the new business’ space has been missing. The Washington Street folks that I know did understand they would be living above a bar or restaurant, BUT they have a right to a healthy quality of life, like being able to sleep at night! I am in favor of major building noise reduction retrofit initiatives with Health, Zoning and Building Departments working in cooperation with mixed use businesses, building owners and residents. Establishments have a right to run their business within the confines of their leased space, but NOT to affect others’ quality of life who live/work outside of that space. Zoning still needs to review whether it makes sense to have so many bars and restaurants so close to each other…check how other Cities handle methods of neighborhood balance. I agree with Mr. Kimmel. The absolute noise levels and relative to background levels is the easily measurable part. Loud music over an extended period of time has a noticeably deleterious effect on health. So to suggest that the noise of a whisper at five feet justifies hours of loud music and thumping bass-lines is (to use my new favorite made-up word) “lunatically” (LUNACY). What about the email to all at city hall, why just Brian? Wont the entire counsel vote on something someday soon? Why not put everyone in the loop now and bcc NON? It is a specialty of Connecticut politicians to find a solution, and then go looking for the problem. This exercise is just part of the long-term grooming of a future lifelong democratic party operative. Noise and plastic bags. These are the issues that really smack at the core issues affecting residents. But good for filling out a resume. Which brings me to the news delivered at the January 15th BOE meeting, where Frank Costanzo delivered the shocking news about residency confirmation for new registrations, and what that process uncovered. Specifically, that a huge number of the 153 new students lived in multi-family dwellings that lacked a legal lease. Does the BOE share that information with the city? Names and addresses? Because from what I can uncover, Norwalk HAS ordinances on the books that address these issues. Typically thought of as falling under health, or certificate of occupancy, or other. The first thing is – is the landlord even on the books? Landlord Identification Ordinance – adopted 8/13/2013 (before Harry) – essentially states if any “dwelling unit” that is not owner-occupied, the landlord must register with the Director of Public Health. Next up – what is permissible? PERMISSIBLE OCCUPANCY: The maximum number of persons permitted as family or household or not more than five unrelated people to reside in a dwelling unit or rooming unit, based on the formula for square footage stated in § 59-7 of this chapter. What about the “Responsibilities of owners and occupants? It shall be a violation of this chapter for any occupant or tenant to increase the number of persons in the dwelling unit rented by him beyond the number permitted in this chapter, and whenever such occupant or tenant is found responsible for such violation, such person will be subject to the penalties prescribed herein. We know there is a problem – it was just confirmed. We’ve known it has been a growing problem for at least the past 5 years – the current Mayor campaigned on cleaning up planning & zoning – how about enforcement? The only question is – when will we as residents get an ordinance committee that addresses this issue with the same zest they put into noise? When will there be a special session? When will we get data? When will anyone in the media put the story together, and ask the questions? When in comes to enforcement, Norwalk is the wild west. Police sit in the crusier playing with their phone watching cars speed through redlights. 8 people live in a room, their vheicles parked on the lawn. Your’ uptight about noises from bars and plastic bags. Yes, we anticipated some noise, but not 70+ decibels lasting into our bedroom till 1 or 2AM in the morning every day as well as everything vibrating from low frequency bass. If we had known, we obviously would have chose not to live here. It’s gotten better as of late, but the first four years were a struggle to say the least. Furthermore, anyone who says that we should have known or feels that 70+ decibels blasted into a residential bedroom from below is acceptable at anytime is just part of the problem and not seriously open to any real discussion. No one should be able to buy a home anywhere and then learn that they now will be subjected to loud noise or music whenever their neighbor feels like it without any ramifications. Norwalk has a responsibility to protect its citizens health regardless of where they want to live; Washington Street included. That being said, these commercial units have the ability to migrate their noise levels to some degree but choose not to due to the high costs required to do so. They’re old buildings (circa 1860’s). I’m not sure if this is possible, but I’d like to see if the City of Norwalk could somehow help these existing “older” properties with these costs through the form of grants or tax credits. Just a thought. so what about the rock crushers and contractors yard on Meadow st? Who spoke on our behalf? I have a business in Norwalk and I reside in Norwalk. Everyone brings up good issues and they can all be easily addressed by compromise. That’s essential in a democracy. More notice should definitely be given, this affects even people who don’t live in SoNo. NOISE: Landlords, business owners and residents will have to sacrifice. Whether it’s retrofitting leased spaces to reduce noise or some residents moving out of the neighborhood. Can’t be a complete win for anyone, that’s just not how things work. I have two little kids and I never go to SoNo but I want it to be a vibrant, lively neighborhood and it’s not right now. All big/popular cities have noisy neighborhoods for the people who enjoy that kind of thing. Norwalk should have that too. It’s also true that it is much harder for a business to move than a resident. I say that as a business owner and resident of Norwalk. NYC, DC, Montreal, Barcelona, Amsterdam, and more have extremely noisy neighborhoods, nobody is going insane over there due to noise and property prices have thrived for years. I think helping SoNo become a destination for bars/restaurants/fairs will be great and that should be given priority. Most residents come and go, businesses that thrive stick around for decades. My two cents. PATRICK: You bring up some great unrelated points. The amount of cars outside some homes has become a nuisance. Making simple turns is hard because you can’t see due to cars being parked close to corners of street. Cars parked on the curb on Spring Hill Avenue, so you can’t even walk on the curb with a stroller, you have to walk on the street. It’s a lawsuit waiting to happen. As the city presses forward with tax breaks to retrofit older buildings in the “other” downtown revitalization area, including “micro-units” to create “vibrant” streets there, perhaps its time to figure this out in terms of construction standards before we increase the number of citizens exposed to this health risk. NYC ( arguable one of the most vibrant cities in the world) does not allow any construction activity between 6pm and 7 am without a permit. The law balances buisiness and residential needs. Noise ordinance should also include lawn maintenance. Excessive leaf blowing is not only a noise problem- but a major health issue. Large leaf blowing machines spew mold and bacteria in the air- and degrade soil health. @Patrick Cooper, well said. Washington st. was once a dead block of empty storefronts except for Bat’s Shanty Tavern. The bars and restaurants make SoNo a vibrant destination. Does anyone buy a property above a bar or across the street, or even a block away without asking themselves if they can live with the inevitable noise?